The Wayne County, Ohio, Auditor's Office phased out its paper-based process and replaced it with a digital reappraisal solution that has improved the integrity of the data its employees enter into CAMA. The solution earned the county a Special Achievement in GIS Award at the 2013 Esri User Conference. Under state law, the auditor's office in every Ohio county must conduct a reappraisal of all real property in the county every six years to update values for taxation purposes. CAMA databases contain information such as property condition, size, land cost, and other variables that are used by appraisers to determine the most accurate market values. "That process required the appraiser to make two trips to each property toting maps, cards, and documentation that they wrote on," said Jarra Underwood, Wayne County Auditor. "Back at the office, a data entry team directly entered the written information from the cards into the CAMA database." "It made sense for BHA [staff] to design the new reappraisal system because of their familiarity with our office," said Underwood. "Also, the parcel maps they created would be an integral piece of the new appraisal system." BHA began interviewing county staff to become familiar with the workflow throughout the county's six-year mass reappraisal cycle. After that discovery phase, BHA created a schematic showing how the paperless system would work. The document detailed how each component of the Paperless Reappraisal System (PRS) would integrate and interact with the county's CAMA. The system would give appraisers the digital tools to directly update tabular data themselves rather than handing off cards and documentation to data entry staff. 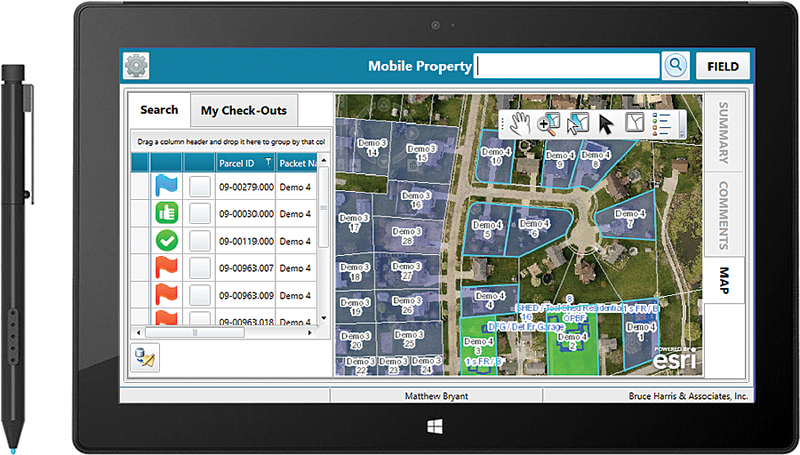 "When appraisers open the digital property record on their Windows tablets, they see parcels organized in 'packets' that optimize logistics without the previous constraints of a hard-copy tax map," said GIS director Travis Gregorich. "PRS also tracks revision history and any other changes that appraisers make, giving us the ability to promptly identify and resolve problems before updating databases." 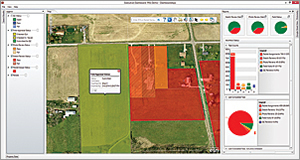 All apps in the PRS suite connect to the county's GIS platform. A sketch reviewer tool accesses imagery and feature layer services from ArcGIS Online that display building footprints, allowing appraisers to verify building dimensions. 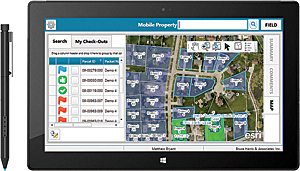 To eliminate unnecessary visits, a photo reviewer lets the inspectors make virtual inspections of property. "Appraisers can see building sketches as vectors from the county's CAMA," said Gregorich. "Oblique imagery and map services validate the existence and size of dwellings. Failed validations can be flagged and annotated." "Seeing the building data and polygons overlaid on imagery helped us see things that our generic CAMA sketches didn't show," said Gregorich. This new information resulted in a nearly $24 million increase in market valuation resulting in additional tax revenue. The office has also experienced tremendous time savings with the new system. In 2008, the first phase of the appraisal process took a full year to complete compared to just seven months for the same process in 2014—a 42 percent improvement. The office also significantly cut map and property card printing costs. "The 2008 reappraisal process generated at least two paper copies [each] for approximately 59,000 parcels, while in 2014, hard copies were nearly eliminated for residential and agricultural parcels," said Gregorich. "We also cut our temporary staffing budget in half compared to 2008." By providing appraisers with an ordered list of on-site assignments and desktop review capabilities, the appraisal staff spent less time in the field, so the paperless solution saved fuel as well as trees. The solution was so successful and adaptable to most county reappraisal workflows that BHA developed PRS into a commercial off-the-shelf solution for all small governments to download and use. It's currently available at ArcGIS Marketplace. Underwood's initial goal wasn't saving money but increasing efficiency and accuracy to better serve the county's property owners. Between a shortened time line, reduced workforce, and lower mileage, the improvements in the reappraisal process from PRS far exceeded what the county had expected.